Southeast Bottling & Beverage offers businesses a best-in-class bottling process for their new or established ready-to-drink beverages. As one of the preferred contract bottling companies in the US, we have perfected the bottling process and can ensure that every product that is manufactured in our facilities is made to perfection. Southeast Bottling & Beverage is one of the nation’s few comprehensive contract bottling companies, and we offer services that are unmatched by others in the industry. We can assist in nearly every stage of the beverage manufacturing process, from assisting with product development and ingredient procurement to completing manufacturing, labeling, packaging and more. Our new, 76,000 square foot facility was built to cGMP (Current Good Manufacturing Practice) regulations to ensure that every product we manufacture is safe to use and contains the high-quality ingredients they claim to have. We also have five filling rooms that are each individually HEPA filtered and climate-controlled to prevent cross-contamination and maintain the strictest sanitation standards throughout all stages of bottling. Additionally, we have a separate pharmacy that is also HEPA filtered to measure ingredients along with an air-conditioned warehouse to store your raw ingredients before and during production. This is to ensure that your ingredients maintain their quality and stability. All of our rooms are designed to keep your products fresh. We also offer plastic bottles from 2 ounces to 64 ounces, a bottle air flush, rotary filler, inline filler, sleever, labeler and more. Better still, our facility is certified to produce Halal, Organic, and Kosher products, which makes us the ideal partner to handle the bottling process for nearly all of your specialty RTD products. 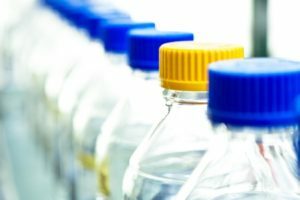 We are the contract bottling experts and proud to serve businesses in Alabama, South Carolina, Virginia, Tennessee, Maryland and the neighboring states, so contact us today for more information about what our bottling process can do for your business. Let us take the guesswork out of beverage manufacturing. We provide you with everything that you need, from bottles, ingredients, & labels. Copyright 2018 Southeast Bottling & Beverage. All Rights Reserved.